ROHAN MASCARENHASM.D.S., D.I.B.O.,Professor Dept. of Orthodontics and Dentofacial Orthopaedics Yenepoya University , Mangalore, Karnataka, India. GOPAL KRISHNA B.R. Lecturer Dept. 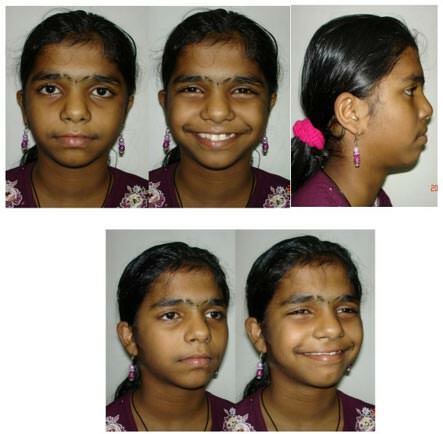 of Orthodontics and Dentofacial Orthopaedics College of Dental sciences, Davangere . SHAHISTA PARVEEN M.D.S., Lecturer, Dept. of Orthodontics and Dentofacial Orthopaedics Yenepoya University, Mangalore, Karnataka, India. Tooth transposition is a positional anomaly that may create many orthodontic problems from both esthetic and functional points of view. In this case report, we describe a case of the orthodontic management of a transposition of the upper canine and premolar with congenital absence of the upper left lateral incisor and peg shaped right lateral incisor. The patient was treated with a preadjusted Edgewise appliance and extraction of Upper right lateral, Lower right lateral and left first premolar, the treatment was completed without a need for any prosthetic replacement. Key Words: Canine- first premolar transposition; atypical extraction; premolar substitution; congenitally missing lateral incisor. Intraoral examination showed Class I molar relation on right side, End on molar on left side, (lass II, left subdivision), Class I canine relation on both sides. (figure 2) On examination complete transposition left permanent canine with 1st premolar. The transposed canine was displaced facially and fully erupted to the buccal between the premolars. The first premolar was tipped distally and rotated mesiopalatally. In addition, upper left lateral incisors are congenitally missing, upper right lateral incisors are Peg shaped. Since the left maxillary lateral incisor was congenitally absent, the upper midline was deviated to the left. (figure2) Lower left lateral incisor was lingually placed. Maintain maxillary canine - premolar transposition; the transposed premolar to be used in occlusion by substituting it for maxillary lateral incisors. Corrective positioning of transposed teeth to their normal positions in the arch. Correcting the transposition orthodontically and establishing natural tooth order without extraction. 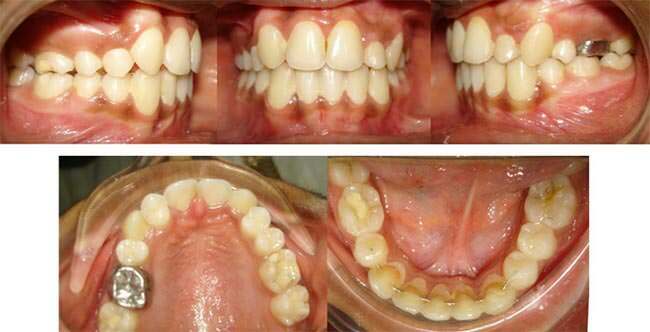 Recent trend in the management ofMxC.P1 is Orthodontic movement of the teeth into their normal anatomical position.10-13 It is not always advisible to attempt to correct transposed teeth in the permanent dentition because of the potential risk of damaging the teeth or supporting structures. Maintaining the transposition, creating space for missing lateral incisor and prosthetic replacement of missing lateral, composite buildup for upper left peg lateral. Since patient had convex profile, non-extraction treatment would not have been viable option. Potential benefits and risks of the various treatment plans were explained to the patient and to her parents. Thus, alignment of the involved teeth in their transposed positions seemed to be the best treatment approach. Extraction of maxillary right peg lateral (12), Extraction of lingually placed 32, extraction of 44 for the alignment. Extraction on transposed side was not done as there is congenitally missing Lateral incisor. Align the remaining teeth, maintaining the transposition. Left premolar would be substituted for left lateral incisor. Right canine would be substituted for right lateral incisor, right premolar for right canine. To establish Class II molar on right side and Class I molar relation on left side. Orthodontic tooth movement is initiated with 0.022 slot MBT bracket system in both the arches starting with 0.016 NiTi. After progressing through a series of wire, (.017x.025 NiTi, .019x. .025 NiTi,) maxillary and mandibular stabilizing wires (.019x.025 SS) were inserted and retraction spaces were closed with elastomeric chains. After removal of fixed appliance, a wraparound retainer in the upper arch and a 3 -3 lingual bonded retainer were placed in the lower arch for retention. Overall active treatment time was 24 months. Analysis of final records shows that all treatment objectives were achieved. (Figure 5, 6, 7) Class I molar and Canine I relation is achieved on left side. Upper left first premolar (24) is brought in place of upper left laterals (22). The overbite was reduced and the dental esthetics improved markedly. Ideal occlusion could not be achieved on right side due to difference in mesiodistal width of substituted teeth. Upper right canine (13) is brought in place of Upper right lateral incisors (12). Upper right premolar brought in place of right canine. The causes of all transpositions have not yet been fully explained; however, many theories as to the possible etiology of tooth transposition have been implicated such as tooth trauma, retained primary teeth, ectopic formation of the dental follicle, ectopic eruption pathways, and genetic predisposition etc.2-7 It has been reported that a large number of cases with transposed teeth are associated with dental anomalies such as a peg-shaped lateral incisor and congenitally absent teeth.3,4,8,9 Peck et al in his study3,4 concluded that the maxillary canine-first premolar transposition was associated with tooth agenesis or peg-shaped lateral incisors in 49% of cases. This case also displays a similar absence of lateral incisor and peg shaped laterals and transposition of premolars and canine. When the transposed teeth are almost completely erupted, the treatment involves either complete correction of the transposition13-16 or alignment in the transposed positions or extraction of one of them or both. Many cases of orthodontic treatment of transposed teeth have been reported, and substitution of a transposed premolar for a maxillary lateral incisor have very few case reports.10,11 Nestel and Walsh10 reported unilateral substitution of a premolar for a lateral incisor in a case of bilateral maxillary canine-premolar transposition and unilateral congenital absence of the maxillary lateral incisor. When maxillary canine-premolar transposition is associated with a missing maxillary lateral incisor, the substitution of the premolar for the lateral incisor could be chosen to avoid prosthetic restorations with a bridge or implant. Sato K12 reported extraction of 3 teeth to correct the midline and mandibular discrepancy. Transposed maxillary premolar was substituted it for missing lateral incisor. Parker 12 reported the long-term stability of orthodontic treatment by bilaterally substituting the premolars for the lateral incisors in a case with bilateral maxillary canine-premolar transposition coupled with a congenitally missing maxillary lateral incisor. Treating this case by extraction of maxillary 1st premolars would have required opening up space for missing lateral and composite build up for peg shaped lateral. By substituting premolar for lateral incisor, a prosthetic replacement was avoided. 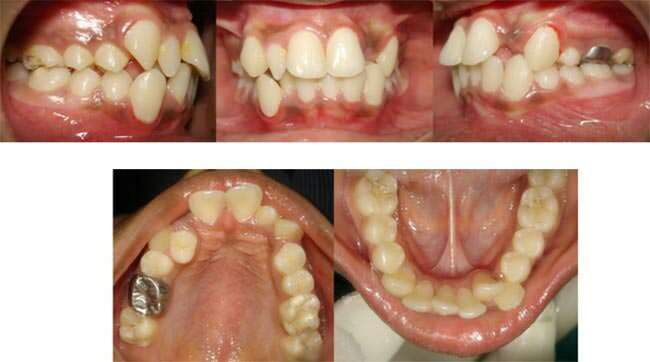 Extraction of peg lateral not only relieved crowding but also brought about symmetry. Although the prevalence of tooth transposition is low, with this type of dental anomaly orthodontic management is a challenge. Additionally, if there are congenitally missing teeth associated with the transposed teeth, treatment planning becomes even more complicated. Achievement of optimal function and esthetics in such cases requires meticulous treatment planning. Shapira Y, Kuftinec MM, Stom D. Maxillary canine-lateral incisor transposition-Orthodontic management. Am J Orthod Dentofacial Orthop 1989;95(5):439-44. Shapira Y, Kuftinee MM. Tooth Transposition-a review of the literature and treatment considerations. Angle Orthod 1989; 59(4):271-6. Peck L, Peck S, Attia Y. Maxillary canine-first premolar transposition, associated dental anomalies and genetic basis. Angle Orthod 1993;63(2):99-109. Chattopadhyay A, Sirinivas K. Transposition of teeth and genetic etiology. Angle orthod 1996;66(2):147-52. Shapira Y, Mladen M, Kuftinec MM, Stom D. Maxillary tooth transpositions: Characteristic features and accompanying dental anomalies. Am J Orthod Dentofacial Orthop 2001;119:127-34. Nelson GC. Maxillary canine/third premolar transposition in a prehistoric population from Santa Cruz Island, California. Am J Phys Anthropol 1992;88(2):134-44. Peck S, Peck L, Kataja M. Mandibular lateral incisor-canine transposition, concomitant dental anomalies, and genetic control. Angle Orthod 1998; 68(5): 455-465. Shapira Y. Transposition of canines. J Am Dent Assoc. 1980;100(5):710-712. Nestel E, Walsh JS. Substitution of a transposed premolar for acongenitally absent lateral incisor. Am J Orthod Dentofac Orthop.1988;93(3):395-399. Parker WS. Transposed premolars, canines, and lateral incisors.Am J Orthod Dentofac Orthop. 1990;97(5):431-48. Kuroda S, Kuroda Y. Nonextraction treatment of upper canine-premolar transposition in an adult patient. Angle Orthod.2005;75(3):472-77. Bocchieri A, Braga G. Correction of a bilateral maxillary canine-first premolar transposition in the late mixed dentition. Am J Orthod Dentofacial Orthop. 2002;121(2):120-128. Filho LC, Cardoso MA, An TL, Bertoz FA. Maxillary canine first premolar transposition. Angle Orthod. 2007;77:167-175.